Do you need help measuring your Pinterest activity? Are you wondering which tools can help you grow your followers on Pinterest? In this article, I’ll show you 4 tools to help you analyze and grow your presence on Pinterest. The average Pinterest user follows nine brands and spends just over 15 minutes on the platform. That means to compete, you have to be able to serve up fantastic images, measure the impact of your efforts and connect with new followers on a regular basis. If you don’t have a large budget to sink into your Pinterest strategy, integrating the time-saving shortcuts and functions of a few affordable tools can work wonders. 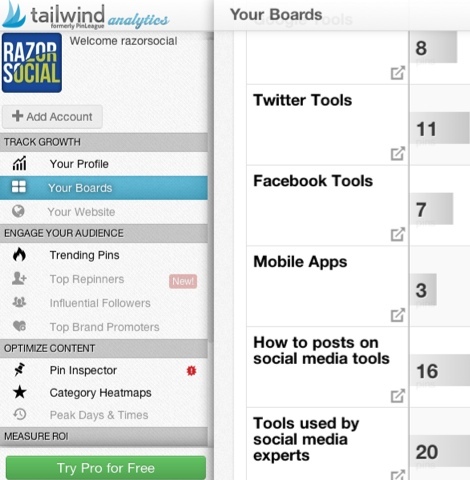 While Pinterest provides some basic analytics to help you assess the performance of your Pinterest account, if you want more advanced analytics and the ability to analyze your competitors, Tailwind is a good application. 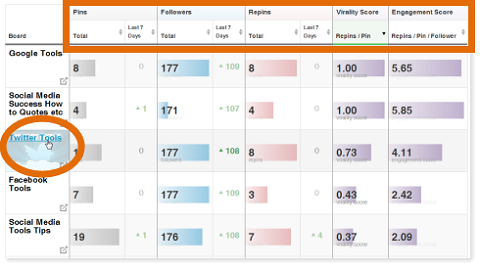 Growth Tracking of fans, followers, boards, likes and pins—View graph reports based on default or custom date ranges. Track the volume of pins from your website. Audience Engagement Details—Find trending pins, your top repinners, most influential followers and a table of the people who share content the most. Content Optimization—View details for each piece of content to help you decide how to optimize (e.g., view the time and day of the week when most pins occur). ROI Measurement—Through integration with Google Analytics, view the website traffic and revenue that’s generated from Pinterest and view the individuals who drove that traffic. Competitor Benchmarking—Benchmark your analytics against your competitors. Collaboration—Share your account with multiple team members. Enterprise Features—At the enterprise level, you can create custom reports, set up keyword monitoring and run influencer campaigns to identify, vet and recruit key influencers. There’s a paid version of Tailwind, but you can start with the free version. Just enter your Pinterest username and select the Create Free Dashboard option. Note: Certain features we cover below, such as competitor benchmarking and measuring your ROI, are included only in the paid version of Tailwind. Creating your free dashboard is easy. When you first log in, you’ll see a screen similar to this. The Tailwind menu. Because this is the screen for the free version, not all of the options are available in each menu section. On the left is the menu and on the right you see content relevant to the menu item selected. In this case, Your Boards is selected. Let’s take a look at what each section offers. The Track Growth section is where you view the performance of your Pinterest account. 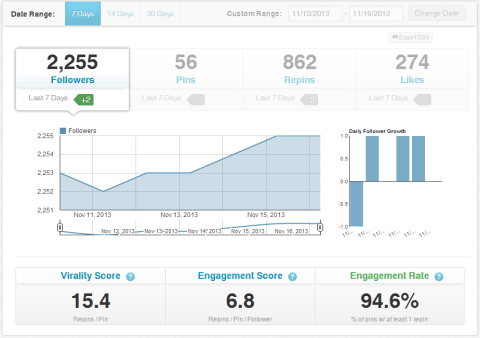 Click on Your Profile to see your follower growth and stats that give an indication of how well your content is doing. For example, you can easily see how many pins, repins and likes you’ve had on your boards and how each of these stats has increased or decreased over time. 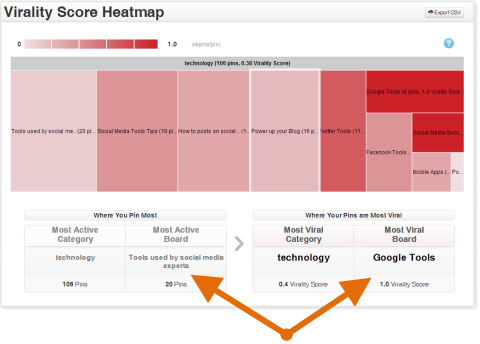 Virality Score is found by dividing your total repins by your total pins. A score of 14.5 means that over 14 times the amount of content you are pinning is repinned, which is very healthy. 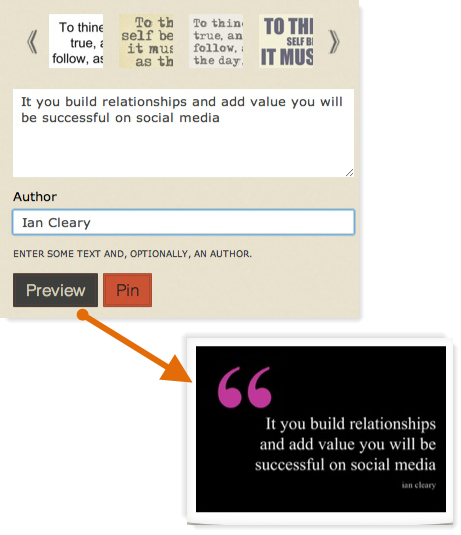 Engagement Score is found by dividing your total repins by total pins divided by followers. This score lets you see how engaged each follower is with your content. 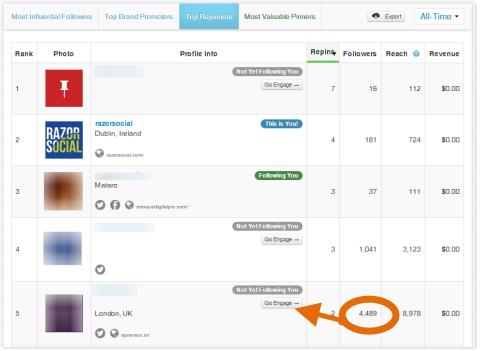 In this example, each follower engaged with an average of 6 pins over the last 7 days. Example of the Your Profile graphs. Engagement Rate is the percentage of your pins that are repinned at least once. This will reveal how relevant your content is to your audience. In the example above, nearly 95% of the pins in the last 7 days were repinned. A phenomenal engagement rate and one I’m sure we’d all love to achieve. On Your Boards, a breakdown of performance helps you determine which boards are most popular or are having the greatest impact. Use the arrows to sort the data in each column and focus on a specific stat such as Followers, Repins, Virality Score or Engagement Score. Click on any of the board titles to drill down further via the Pin Inspector and see the performance of all the pins on that board. Sort the table by any column and click on any board to drill down and see detailed stats on the pins that make up that board. If you upgrade to a paid plan, Your Website will show stats and details on pins that are created directly from your website. These are mainly pins that other people create when they find something on your website that they want to share on their own boards. You can also view the trending pins from your website to see which images are most attractive to pinners. Identify the best-performing images from your website. Explore this section to view details of your most engaging content and the audience that’s sharing it the most. Trending Pins will show which images on your website are getting the most engagement on Pinterest and who is pinning them. Under Top Repinners, you see the people who repin your content the most, while Top Brand Promoters shows you the Pinterest users who mention you the most in comments. You can also see which of these users aren’t following you. 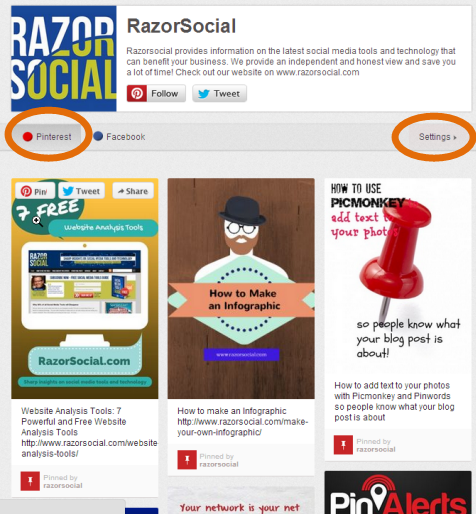 Use Influential Followers to identify the most influential people on Pinterest who are following your boards. 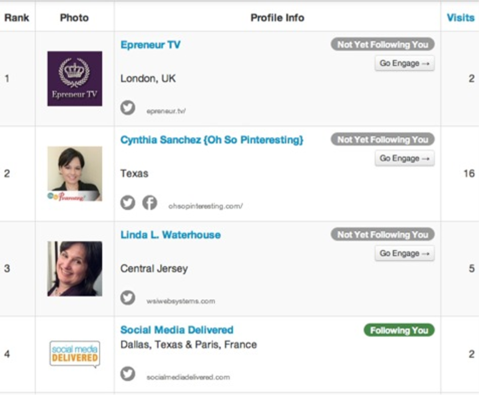 These pinners are ranked by influence and show up according to the number of followers they have on Pinterest. It’s very useful to see which of your top repinners aren’t following your boards so you can start engaging with those who have a large following. Use this section to identify trends and monitor the type of content that’s resonating with your audience. What you learn here will help you recognize current interests and post content that continues to engage them. 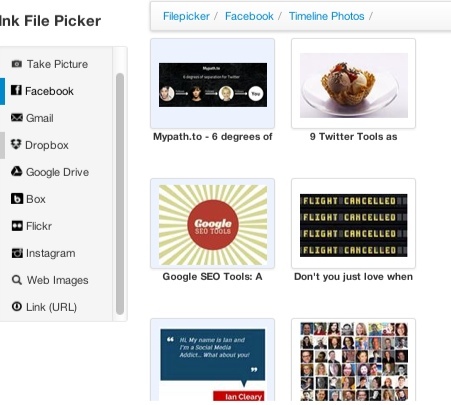 Find a detailed list of the most recently pinned images in the Pin Inspector. You can see the number of repins, likes and comments for each pin, then sort the columns to see what type of content works best. The Category Heatmaps provide a visual summary of the categories and boards that are performing the best. The size of the box indicates the volume of pins on that board, and the color indicates the level of action on that board (i.e., repins to pins). Darker colors mean more engagement. As its name suggests, Peak Days & Times will show the best (and worst) times and days for you to pin. Are you focusing your efforts in the right area? If you connect your Pinterest and Google Analytics accounts, Traffic & Revenue will show referral traffic from Pinterest and the estimated revenue generated as a result of this traffic (assuming you have goals set up with values attached). The Valuable Pinners section lets you see people who pin content that drives traffic to your website. If these are influential people, follow and engage with them to encourage more sharing. See who drives traffic to your site. This is where you perform benchmarking of your Pinterest account against your competitors’ and see how you compare with regard to followers, pins, repins and more. With Competitor Benchmarks and Competitor Intelligence, you can compare the performance of your Pinterest profiles or the breakdown of pinning from your websites. 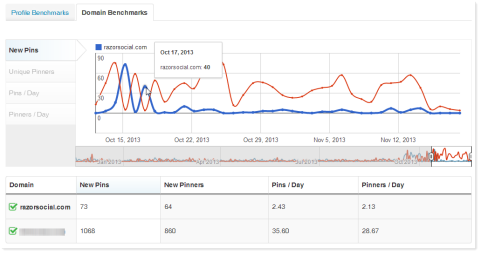 Compare the volume of pinning from a competitor’s website to yours. If Pinterest’s baked-in analytics don’t provide you with enough detail and you want competitor analytics, Tailwind will help you monitor your analytics and gain valuable insights into how you can grow your presence on Pinterest quickly. 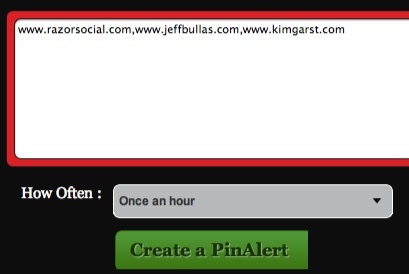 PinAlerts helps keep you informed of any items that are pinned onto your boards from your site. You can even track when images are pinned from your competitors’ websites. Sends alerts when items are pinned from a website. To register an account for alerts, provide your name, email and website URL. When you log into the account, you immediately see the Add screen where you enter the websites you want to track (e.g., your own website and/or your competitors’ websites). Enter a list of competitors’ websites separated by commas. Tell PinAlerts how often to send you alerts for each website. Example of the alerts delivered by email. 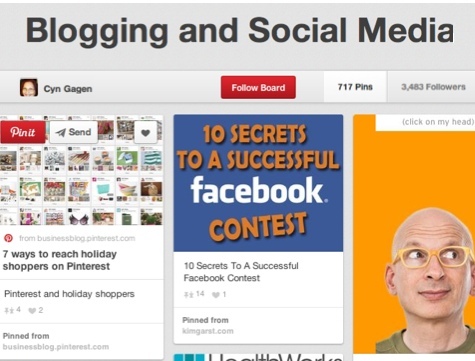 These alerts are particularly useful if you want to grow your following on Pinterest. As you find people who pin content from a competitor or who pin content relevant to your brand, you can use the live Pinned By link to visit their profile and follow them. You can also click on the Board Name link to find out where they’re pinning the image and follow the board. It’s very likely they’ll follow you back. 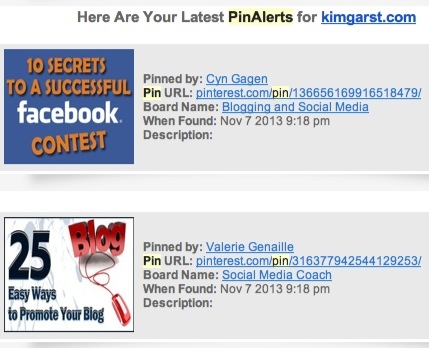 Here’s an example of a board that Kim Garst‘s image was added to. The owner of this board has 717 pins and over 3,000 followers so she’s a good candidate for me to follow and build a relationship with. Example board where a competitor’s content was added. PinAlerts is a simple but useful application that lets you keep an eye on who is pinning content from your competitor’s website. Use the alerts to find out what content is popular and find new followers. If your brand already has a thriving Facebook fan base, it makes sense to let your fans know about your Pinterest boards. But sometimes a status update and link don’t do the trick. Pinvolve is an application that installs on Facebook to display images from your Pinterest boards right on your Facebook page. Display content from your Pinterest account—Synchronize Pinvolve with your Pinterest account and display your Pinterest images. Display content from your Facebook page—Display Facebook timeline images in a Pinterest-like fashion through the application. Go to Pinvolve and click on the Free Get Pinvolve Now button and select the Facebook page you want to add Pinvolve to. Select the Facebook page you want Pinvolve added to. Now you configure the tool with your Pinterest username and the email address associated with your Pinterest account. Select the Pinboard you would like to display. 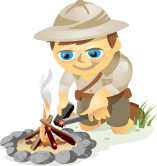 Recent Pins will display the most recent items pinned to your boards. 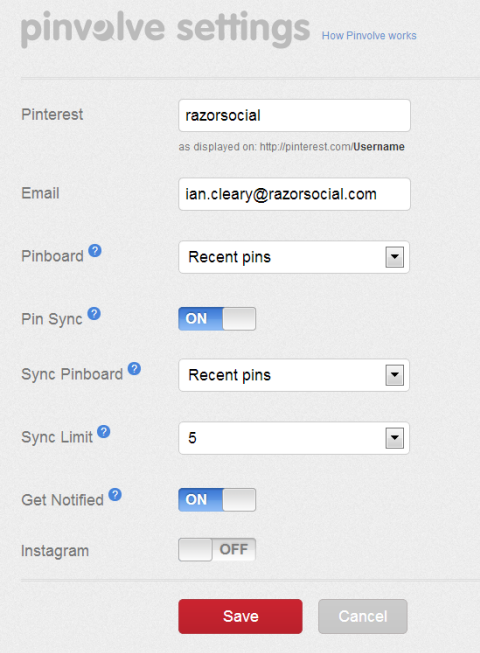 If you enable Pin Sync, anything you pin on Pinterest will automatically post on your Facebook page. You can choose which board will be synced, the maximum number of pins that will post on any given day and if you want to be notified when a sync occurs. This is the only configuration you need for your account. Setting up your account is easy and you can change the settings at any time via the Settings option on the Pinterest tab. When you view Pinvolve on Facebook, the header image includes your logo, company details, a Follow button for Pinterest and a Tweet button. Underneath the header are tabs for Pinterest and Facebook, as well as a link to the Settings. Select the Pinterest tab to show a list of everything that was recently pinned to your Pinterest account. View the recent pins from your Pinterest account. Switch to the Facebook tab to view image posts from your Facebook timeline. Pinvolve displays the images in a fashion similar to Pinterest, which makes it easy to view. 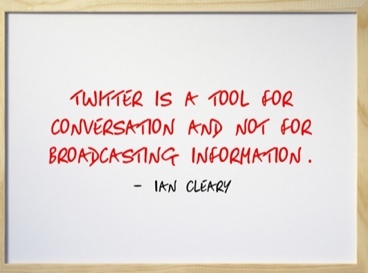 Regardless of which tab your fans are viewing, they can pin, tweet or share anything they see. 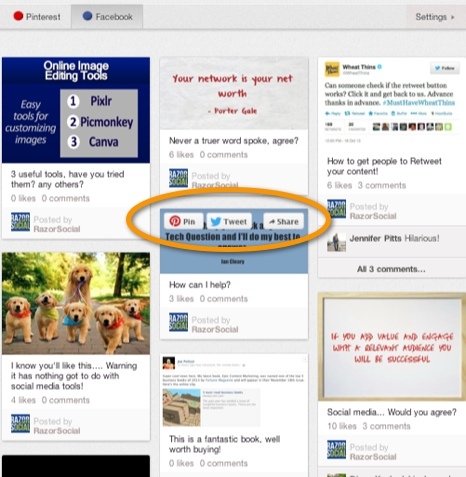 For example, people can easily pin items to their Pinterest or Facebook accounts. Fans can browse through images and either pin, tweet or share them from your Facebook tab. 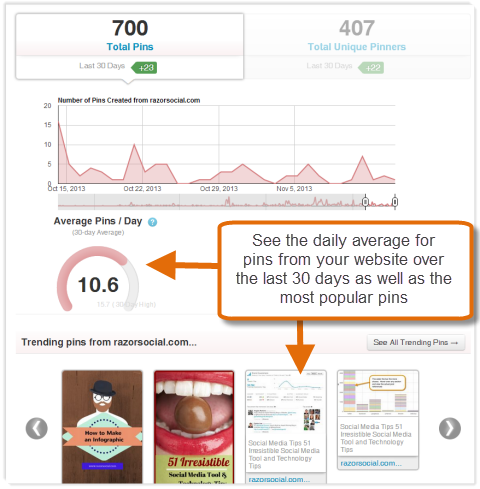 Pinvolve is a great application that lets you increase the visibility of your pins to your Facebook audience. If they’re also Pinterest users, the app lets them scan through and repin your Pinterest posts without leaving Facebook. Very useful! If you want to be successful on Pinterest, good imagery is a must. Since we’re not all graphic artists, tools that make it easier to design great images help even the playing field! Pinstamatic uses standard templates to “make boring data pretty”—especially text. This tool lets you turn quotes, location links and even websites into attractive images for pinning. To get started, go to Pinstamatic, select the type of image you want to create from the menu at the top of the screen, enter the appropriate details to create your image, then preview and pin it. The menu at the top provides quick access to create a range of different pins. Here are some examples of images you can create. Enter in a website address and Pinstamatic will generate a pinnable snapshot of the full web page. If it’s a very long page, you might want to crop a bit off before pinning it. This is a great way to curate a board of your favorite websites. Enter your quote text, add the author if you like, then select the format that matches how you want the quote to appear. There are 12 different styles to choose from so each quote can have its own look and feel. Quoting someone on Pinterest has never been easier. Enter your quote text and choose how you want it to look. Enter the username for a Twitter profile and automatically create a nice Twitter profile image to pin. Now you can share a board of Twitter profiles for your staff or your favorite Twitter users. 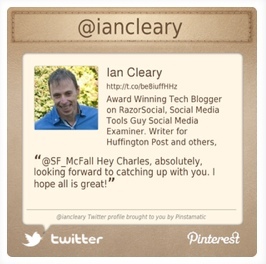 A pinnable Twitter profile image includes the user’s bio and latest tweet. Upload any picture and you can either apply a filter to the image to make it stand out or add a caption over the top and/or bottom of it. You can select your image from a variety of sources, including from a personal photo album on Facebook, Flickr or your computer’s camera. Select pictures from a variety of sources. 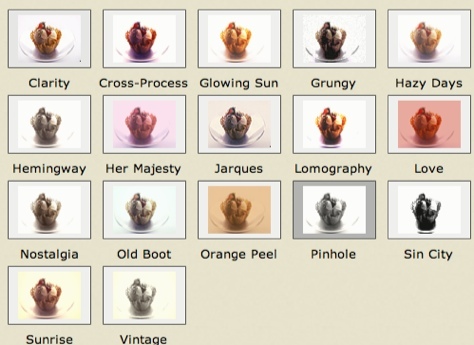 If you want to select a filter for your image, there are 17 to choose from. A good variety of filters are available. Or you can add a caption to the top and/or bottom of your image. The caption text is overlaid so make sure it doesn’t interfere with what’s in the image or it might be hard to read. You can add a caption to any image. Choose from 5 colors to create a Sticky image. Just enter your text and select the color of the sticky note. Create an image based on the physical address of a place using Google Maps. You can even include some additional text on the image and a description for Pinterest. Create an image for a song on Spotify. Enter the song’s name and Pinstamatic searches Spotify for a filtered list of possible songs that match what you entered. Click on the right song and its cover image becomes pinnable. When a user clicks on the image in Pinterest, Spotify opens to play the song. Create an image based on a date. Perfect for “save the date” announcements. 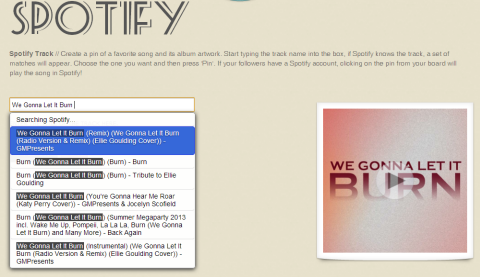 Now you can share a song from Spotify on Pinterest. To be successful on Pinterest, you need creative images. Pinstamatic helps you turn out engaging, pinnable images with ease. 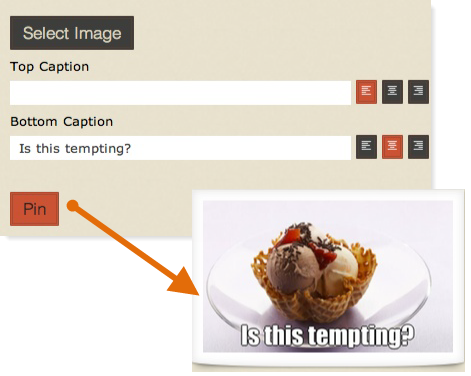 Here are two other useful tools for creating imagery for Pinterest that deserve a mention. Quozio lets you create images related to quotes and it offers 37 different formats to choose from. It’s very simple to use. Just enter in a quote and its source, then pin it. Choose from a variety of quote style formats. When you pin the image, it links back to Quozio by default, so you’ll probably want to change the link to drive users back to your site. 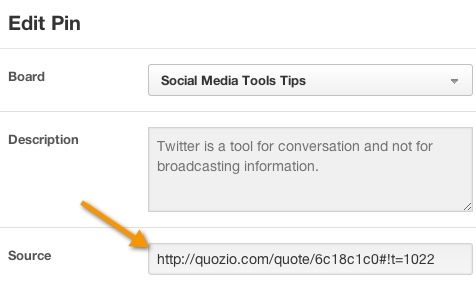 Once you pin your quote, edit it to change the source from Quozio to your own site! Fotor is a cross-platform photo-editing application that provides a lot of great functionality for editing images and it’s completely free. While you can’t pin your images from inside Fotor, you can do fantastic editing on your pictures before you share them out on Pinterest. 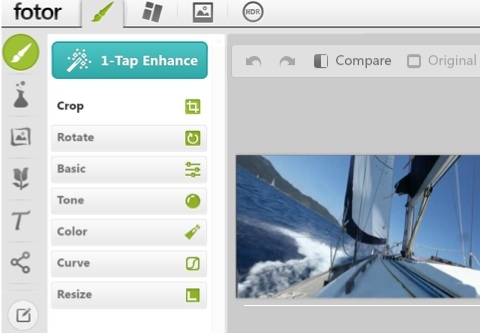 Fotor provides a wide variety of free editing functionality for you! The tools we covered here are either free or low-cost. They let you measure success, improve your images and increase visibility of your pins. Any one of them can help you maximize the benefit of using Pinterest for your business. What do you think? What tools do you use with Pinterest? Do you see value in the tools we covered above? Leave your questions and comments in the box below.